May 16, 2012 centerforgivingLeave a Comment on Collective Impact for St. Louis Children: Where Are We Now? About 18 months ago, via broadcast, email Vision for Children at Risk shared a link with a wide range of St. Louis area organization to an article on “collective impact” that had just come out in the Stanford Social Innovation Review (SSIR). That led to a discussion with several area nonprofits (Vision for Children at Risk and Beyond Housing and its 24:1 initiative) and local funders (Incarnate Word Foundation and Deaconess Foundation) exploring the possible use of a collective impact approach in St. Louis to address children’s issues. In April 2011, a blog appeared in this spot examining how the collective impact approach might be employed in St. Louis. A season of meetings and forums on collective impact followed, initiated by the Incarnate Word and Deaconess Foundations sponsoring a visit to St. Louis by representatives of the Strive Partnership in Cincinnati — an initiative that the authors of the original “Collective Impact” article have identified as a best-in-class example of the approach. The purpose of that initial series of meetings was to raise the awareness of St. Louis area funders and nonprofits about the concept of collective impact and to present detailed information on its use. Additional forums followed, one sponsored by the Nonprofit Services Center in June and another by the Rome Group and Gateway Center for Giving in July. In subsequent months a delegation from St. Louis attended the Strive National Network Convening in Portland, Oregon. Meanwhile in the St. Louis region nearly a score of local initiatives emerged citing collective impact as a core principle of their work. Some initiatives, such as the Nine Network’s American Graduate, have invested the time and effort to fully explore the concept and understand the details and nuances involved in employing a collective impact approach. In other instances it is not altogether clear whether some of the initiatives have a precise grasp of what is entailed in establishing a true collective impact undertaking, as much as they are simply invoking the term. In Summer 2011, the 400 child-serving agencies involved in the St. Louis Metropolitan Children’s Agenda initiated restructuring of the Agenda in a formal collective impact framework. It was announced in November that “Collective Impact for Children” would be the focus on the biennial St. Louis Metropolitan Children’s Summit in Fall 2012. In Spring 2012 a group of community stakeholders was convened by the Brown School of Social Work at Washington University to begin a discussion on evaluation of social impact. So where are we now with efforts to effectively employ collective impact in St. Louis as a framework for addressing critical issues related to promoting the well-being of children and families and, thereby, advancing overall community and economic development in the region? On one hand, it is not the often-typical St. Louis scenario that no one is paying attention to a new idea and that a hot topic has failed to strike a spark in this community. The term collective impact has been infused into the discussion of almost every initiative directed to community change. In the arena of children and youth issues, one can quickly count at least eight initiatives invoking “collective impact” as a tenet. While it is not clear that everyone using the term has a detailed grasp or operational sense of what collective impact means, at least the concept is in their minds and the term is on their lips. On the other hand, there is something uncomfortably familiar here that is consistent with the way the St. Louis region often (usually?) conducts its civic business. It is true that a collective impact approach can be used to address a single issue or problem, as it has in southeast Virginia to clean up the Elizabeth River and in Sommerville, Massachusetts to addressing the problem of childhood obesity. Most frequently, however, when it is employed as a framework for addressing children and youth issues, collective impact is structured as a “cradle-to-career” initiative that encompasses the multiple but closely related needs of children as part of a unified community effort. Strive in Cincinnati, The Community Center for Educations Results in Seattle, the People First Partnership in Memphis, and many other initiatives provide examples of using collective impact in a multifaceted, but unified, approach to addressing the needs of children and families while simultaneously promoting overall community and economic development. As noted, in a little more than a year at least eight initiatives in St. Louis related to various aspects of child well-being are now invoking the term “collective impact.” Those efforts have made use of most of the available major collective impact consultants. While the enthusiasm and energy level being demonstrated here is admirable, it might be fair to suggest that something important is being missed. That vital, missing element would be the concept that collective impact must be collective. Eventually the proliferation and fragmentation of collective impact initiatives in the same geographic area with the same issue focus — in this instance promoting the well-being of children and youth — becomes oxymoronic. There is a tipping point at which multiple collective impact initiatives in the same arena are, by definition, no longer collective. Simply put, there must be a collective aspect to collective impact. The dilemma presented by multiple “collective impact” initiatives strikes at the very heart of the concept, particularly related to the first principle of establishing a shared vision of change and common community agenda. The FSG consultants who developed the concept of collective impact assert that, “Developing the common agenda alone has produced remarkable changes in people’s belief that the future can be different and better even before many changes have been made.” Inability to establish a common vision of what the community needs as a foundation for a shared civic agenda and joint action to achieve shared community goals has plagued St. Louis for decades – or, more dramatically, over parts of the last two centuries. We cannot get to collective community impact built on a common vision and agenda by stacking a lot of individual collective impact efforts on top of one another. The problems with having multiple, closely-related collective impact initiatives are not just conceptual; they are technical and political as well.hat orientation builds centrifugal, rather than unifying, force. One suspects that it is this same civic impulse that led to having 90 municipalities in St. Louis County. The second key principle of collective impact is that the efforts are data-driven and built around a system of shared measurement. At the top level, that system of shared measurement is focused on a short list of indicators intended to track progress on the major goals that comprise the community’s shared vision. There are challenges – both political and technical — in building a system of shared data. It would be impractical — and costly — to design a series of freestanding data systems to support closely-related individual collective impact initiatives. It also is unnecessary, since among these child-focused individual initiatives there is probably about a 75 percent overlap in the relevant data indicators that inform and measure the efforts. That is because the problems the individual efforts are addressing are at root closely interrelated. The central problem with attempting to conduct multiple collective impact initiatives is political. Individual initiatives would be required to compete for, and in the process divide, the St. Louis region’s most desperately needed community asset: civic leadership. Securing such leadership – and marshalling the attendant political clout and financial resources – is a challenge in St. Louis region. It also is the key to moving this region forward in order to make it viable and competitive. If such leadership is to be secured, it mostly likely will be around a unified effort built on a common vision and agenda. The civic and corporate community in St. Louis does not have the time, energy or financial resources to undertake community betterment by having to support a long list of individual, disjointed initiatives that have dissected the cradle-to-career development of the region’s young people into artificially discrete parts. What is needed is a unified effort focused on a broad vision of a regional community in which all children have the opportunity to thrive and the community prospers. The Cincinnati Strive initiative – as well as similar efforts in other metropolitan areas — have been successful in bringing their regions’ leaders together around a unified cradle-to-career initiative to promote the well-being of children in their communities. Early childhood development, health, academic success, youth development, community safety, and economic development have been integrated into a single effort. In that process, these communities are reaching for the golden ring: improving child well-being, spurring community and economic development, and improving the quality of life for everyone in the region. 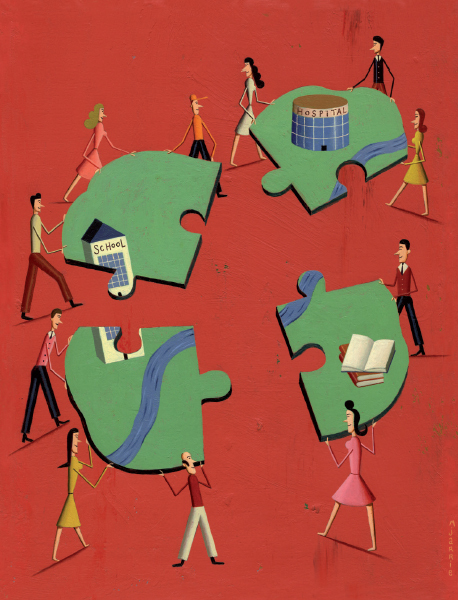 With skill and luck, the St. Louis region may be able to mount a similar unified civic effort. We are unlikely to have success in securing needed leadership for a score of initiatives that have closely interrelated areas of focus. The final – and, by far, largest — conundrum in the St. Louis region is how an effective collective impact initiative focused broadly on promoting the well-being of both our young people and the community as a whole can be put together here, as it has in many of the metropolitan areas with which we compare and compete. Happily, many of the building blocks for a unified collective impact initiative are already in place in St. Louis. A foundation of awareness, experience and expertise related to many aspects of collective impact already exists in the community. In more concrete terms there are resources in the form of data systems, communications mechanisms, existing coalitions, and technical assistance that can be employed in fashioning an effective collective impact initiative. The authors of the most recent SSIR article on the topic, Channeling Change: Making Collective Impact Work, expressly advise building on existing collaborative efforts. Their recommendation is to honor current efforts and engage established organizations, rather than creating an entirely new solution from scratch. What has not yet been identified in St. Louis is the lynchpin organization that can put all the pieces of a unified collective impact initiative together. The authors of the SSIR articles on collective impact identify that player as an “influential champion.” Servings as that champion will require an entity with community credibility, regional reach, financial resources and political clout. It also requires civic leadership and gumption of a sort that has been in short supply here for many decades. In other communities that have mounted cradle-to-career collective impact efforts, leadership has come from existing civic organizations, such as United Way of the Central Carolinas (Charlotte) or from newly established entities, such as the Strive Partnership in Cincinnati. Whatever the source, right now the major missing ingredient in any major St. Louis collective impact initiative is the civic actor who is willing and able to provide the leadership required to galvanize such an undertaking. Click here for the original posting on the VCR Blog.